Casa Sirena Hotel and Lobster Trap Restaurant will be revamped as part of redevelopment. OXNARD — In 2016, the California Coastal Commission approved the complete replacement of Casa Sirena Hotel and Lobster Trap, two long closed, dilapidated properties on the Channel Islands Harbor waterfront. Lessee Brighton Management will soon receive approval to begin grading the properties—razing the buildings and most of the parking lot areas and constructing new foundations. “This work may start as soon as May this year,” Ventura County Harbor Director Lyn Krieger stated. The lease option agreement between Brighton and the county calls for roughly 5,000 square feet of restaurant, a 205-room hotel, and public meeting space situated within the hotel property. Also, the planned construction includes a 10-foot wide, 1,500-foot long waterside promenade, bike racks, rentals and charging stations for those with electric cars. The new Hyatt Hotel will be able to accommodate guests taking shuttles from local airports and train stations. Brighton will also build all new parking lots and a replacement restroom facility for boaters at Peninsula Yacht Anchorage. “This has been a long time coming and will provide a wonderful new amenity for guests and local residents, increasing access to the harbor. There will be improved parking and the new promenade will allow harbor visitors to stroll from the Channel Islands Bridge to the tip of the Peninsula,” Krieger said. The hotel will include an upstairs harbor view bar open to the public. In addition, the adjacent Peninsula Yacht Marina will be revamped during this time period. Temporary restroom facilities will be on site for use by slip holders. 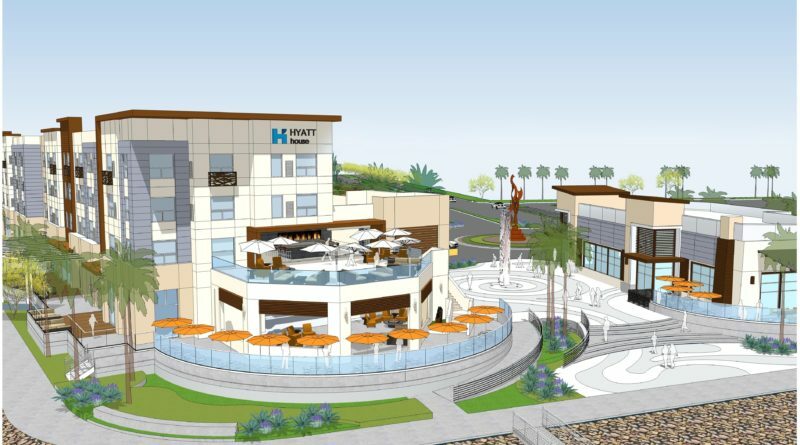 “We are excited to see this come to fruition, and expect the Hyatt Hotel and restaurant will be completed sometime in 2019,” Krieger said. The investment cost of the project is expected to reach between $35 million and $50 million. Ventura County officials have long hoped a revamp of Casa Sirena Hotel would spur a larger redevelopment of the Channel Islands Harbor. Casa Sirena Hotel has been abandoned and dilapidated since 2009, and plans to demolish the building have been discussed for years. The county ultimately hopes to transform the area into a dense visitor-serving waterfront. This is WAY overdue. This will greatly enhance the waterfront. That site has been an eyesore fo years. And the adjacent Marina is basically falling apart. Congratulations to the current California Coastal Commission, Ventura County and the City of Oxnard for coming together to make this happen! This is great news for the military base. We used to use those facilities all the time for meetings and to have our visitors stay at the hotel. Will be nice to be able to do that again. What will happen to the park in the meantime? Remember a thriving hotel and restaurant and am anxious to see it reinstated. What is the delay? No efforts are going forward since the last report of 2/18. Can anyone update us?